Final count on last night’s trip was tally 175 lb. Big Eye, 18 Yellowfin, 4 Hammer Head shark releases, lost a big Mako when it got in the props and a White Marlin that we pulled the hook on. Talk about action all night long and this was one of those trips. Not much else to say except we actually quit tuna fishing in the middle of the night and turned out attention to shark fishing at the request of the charter. I saw more Makos than I have ever seen in one canyon and personally have over a 1000 trips to the deep between South Jersey and the Outer Banks off North Carolina. My crew that included second captain Steve Spagnola, Big Eye Vinnie (Vinnie’s new nick name) and mate Ray echoed the same thoughts about the vast school of Makos that were everywhere mixed right in with the pilot whales. When we put out the first shark rig it took us less than 5 minutes to hook up a decent size Mako that ran at the boat and eventually got caught up in our running gear and we had to cut it off. After that it was nonstop action on big Hammerheads until we made a move and quit shark fishing and turned our attention to swordfishing. We only chummed slightly with sardines as the sharks were so thick we had them coming to the boat with every handful of cut sardines. When we chunked with butterfish we were able to tuna fish as the less oily butterfish did not seem to attractt the sharks like the sardines to the boat. We actually went to sight fishing for Makos with a rig baited and ready to pitch it to a Mako if one came within range of piching a baited rig to it as we got tired of catching and releasing other species of sharks. It reminded me of a number of years ago when I ran an overnight tuna trip out of Morehead City, NC in April with a group that came down from New Jersey. Our goal was to show those NC folks how we fish the Northern Canyons at night since none we knew done there had ever targeted Yellowfins at night chunking. Well the trip ended half way through the night as we had so many different species of sharks eating all our chunks and tuna baits within seconds of putting them out. 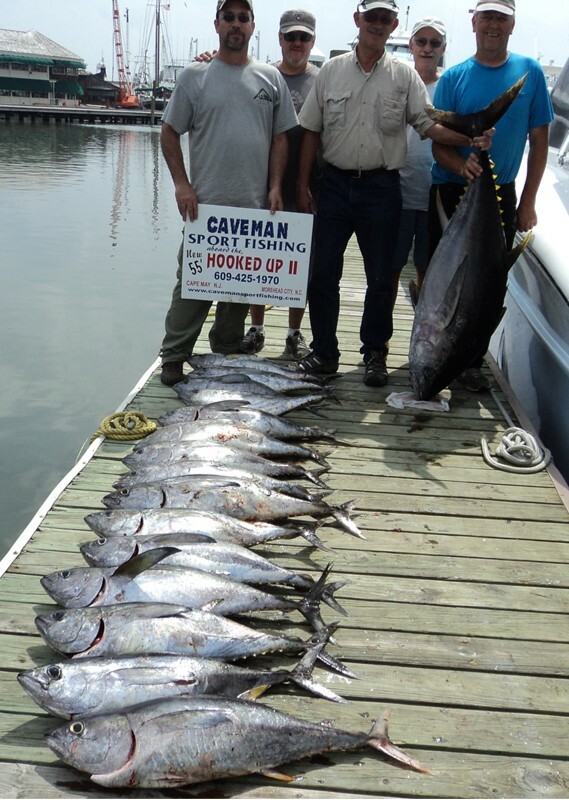 We quickly learned why overnight tuna chunking trips were not done by the locals down there. Bottom line it was another fine trip and as I mention in my previous posts doing a 24 hour overnight trip down to the Washington Canyon is providing some of the finest Big Eye fishing in years and well worth the extra time and expense it takes to make the 90 plus mile run. Doing day trips to canyons closer to South Jersey are just not producing the kind of fishing that the overnight trips offer. PS: Might add the jigging was highly effective last night as the biggest Yellowfins were caught deep on sardine flutter jigs.